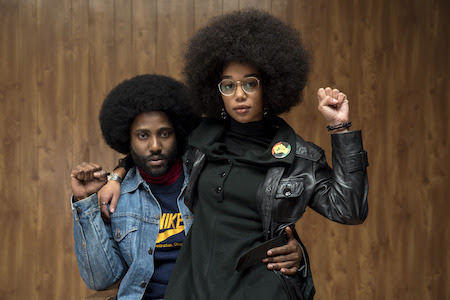 Spike Lee’s been so good for so long that it’s easy to take him for granted, but with the undeniable accomplishment of BlacKkKlansman still fresh in the memory, Metrograph will present a few of the deep cuts in the Lee filmography, a collection of films which encapsulate the various elements of his ongoing artistic practice that brilliantly coalesced in his most recent work: Genre film chops (Inside Man), an anguished sense of duty towards the victims of hate groups (4 Little Girls), an internalized understanding of the national neuroses of the 1970s (Summer of Sam), a stinging satirical sense (Bamboozled), and an affinity for compassionate character study (Mo’ Better Blues). Few American filmmakers have so relentlessly engaged with history, and few in doing so have pointed out such thrilling possibilities for the future of the medium. Ron Stallworth (John David Washington), the first African-American detective on the Colorado Springs Police Department, has taken on a dangerous, far-out assignment—infiltrating the local chapter of the Ku Klux Klan through a cold call, with partner Adam Driver providing the white face for further undercover infiltration. A stirring study in the pathology of race hate, with Harry Belafonte stopping by to offer a heartbreaking history lesson. Denzel Washington is at his most volcanic and charismatic as Bleek Gilliam, a New York jazz trumpeter and bandleader balancing a turbulent love life and a professional life marred by his deteriorating relationship with his gambling-addict manager, Giant (Lee), and his emerging rivalry with saxophonist Shadow Henderson (Wesley Snipes). Energetically shot and riotously colorful, though with a somber, blue note undertone running throughout, it’s a scintillating, unsentimental study in the monomania of the artistic temperament. One of the most audacious movies that Lee ever made, and certainly the most audience-indicting, Bamboozled is a willfully grating media satire, casting an eye toward the digital future of entertainment with its Mini-DV cinematography, while simultaneously looking towards the history of Black entertainers and entertainment in America, imagining a 21st century reboot of the minstrel show. With Savion Glover and Tommy Davidson donning the burned cork to dance for network masters Damon Wayans and Michael Rapaport, both gamely grotesque. It’s another summer and another wave of urban hysteria in Spike Lee’s lookback- in-delirium at the summer of ’77 in the neurotic, hot-pants Italian-American Bronx, where Vinny (John Leguizamo) hits Plato’s Retreat, his old buddy Ritchie (Adrien Brody) imports the new punker style from downtown, a psycho calling himself “Son of Sam” is corresponding with Jimmy Breslin and unloading a .44 (World Series hero Reggie Jackson’s uniform number) on unsuspecting couples caught necking, and then the lights go out city-wide. Long before BlacKkKlansman, Lee was on the case of hate groups in America, here sifting through the wreckage of one of the most heinous Klan-affiliated crimes in history, the September 15, 1963 bombing of the 16th Street Baptist Church in Birmingham, Alabama, which resulted in the deaths of four Sunday school students aged 11 to 14. Reviewing the facts of the crime, as well as the biographies of the victims, Lee creates a profound and poignant picture, one that drives home the unbearable human cost of political violence. Lee proved himself a superb genre director with this stylish, twist-laden hit thriller, starring his repeat collaborator Denzel Washington as a New York City hostage negotiator who has to match his wits against those of an arch-criminal (Clive Owen) who has, with his team, taken over a Manhattan bank and made hostages of everyone inside. While seemingly a departure for Lee, Inside Man, like so many of his films, poses an insoluble moral dilemma to protagonist and viewer both.